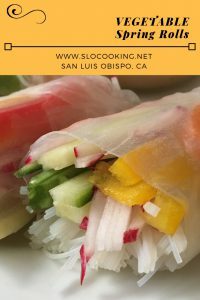 I love making vegetable spring rolls. There are times I just need to eat vegetables. I mean lots of vegetables. And my lots, I mean I really just want to eat vegetables and nothing else. 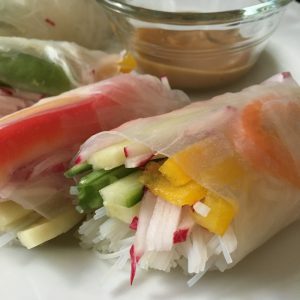 I started making these vegetable spring rolls last year as I was going through my clean eating kick. These are easy to make, tasty and delicious. You can alter the vegetables to match what you have on hand, or you can specifically shop to have everything the recipe calls for. You can also make these in advance, they’ll keep a day or so in the refrigerator. Make vegetable filling: use a box grater or mandolin, slice cucumber, carrot and bell pepper into thin slices. Whisk together rice vinegar, sugar, fish sauce and lime juice in a large bowl. Add vegetables and scallions, toss to coat. Soften rice paper wrappers with warm water. Follow directions on the package. Working on one at a time, soften rice paper wrapper, slowly remove it from the water and place it on a plate. Fill the center of the softened wrapper with 1-2 tbsp. cooked noodles and top with sliced vegetables, top with cilantro and mint leaves.